Prepare the ingredients, weighing 150 g sugar and 1 p. vanilla sugar into one bowl, 100 g flour, 100 g corn flour and 2 teaspoons baking powder into another bowl. 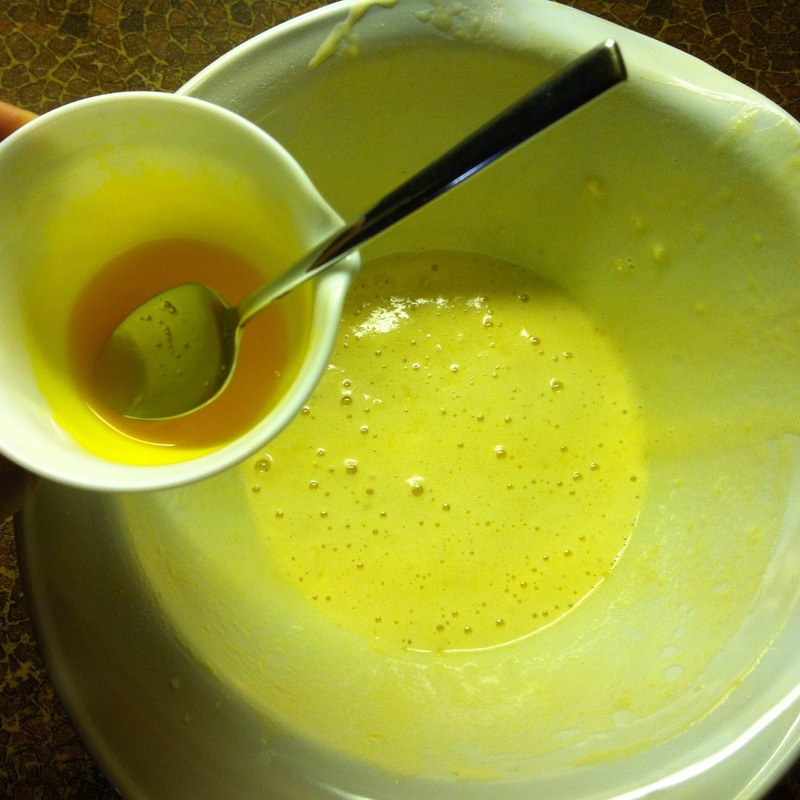 Beat 4 eggs and 3 tablespoons hot water at the highest level. 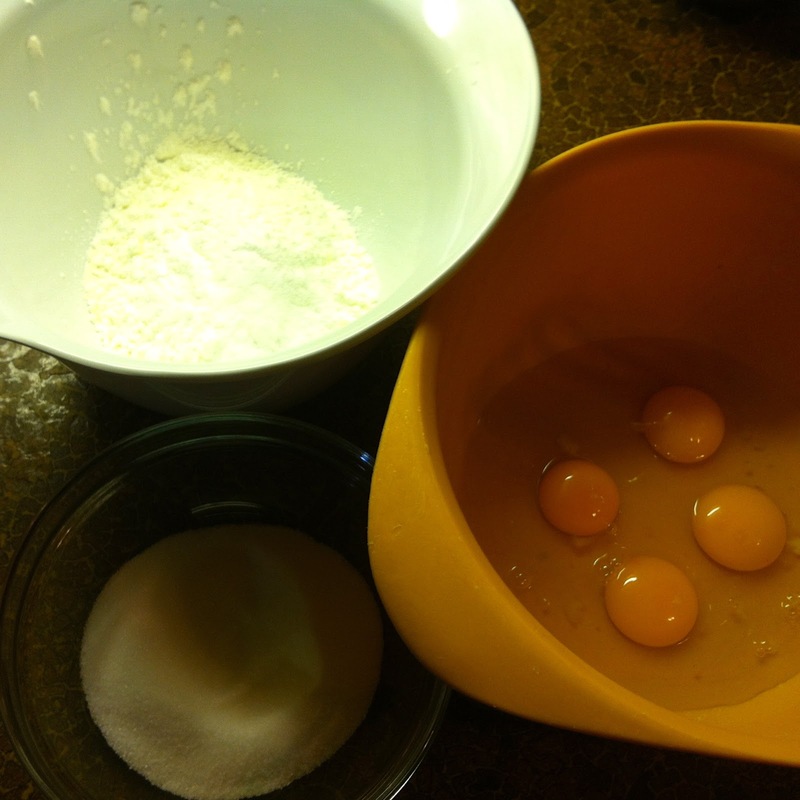 Add the sugar and continue to beat. 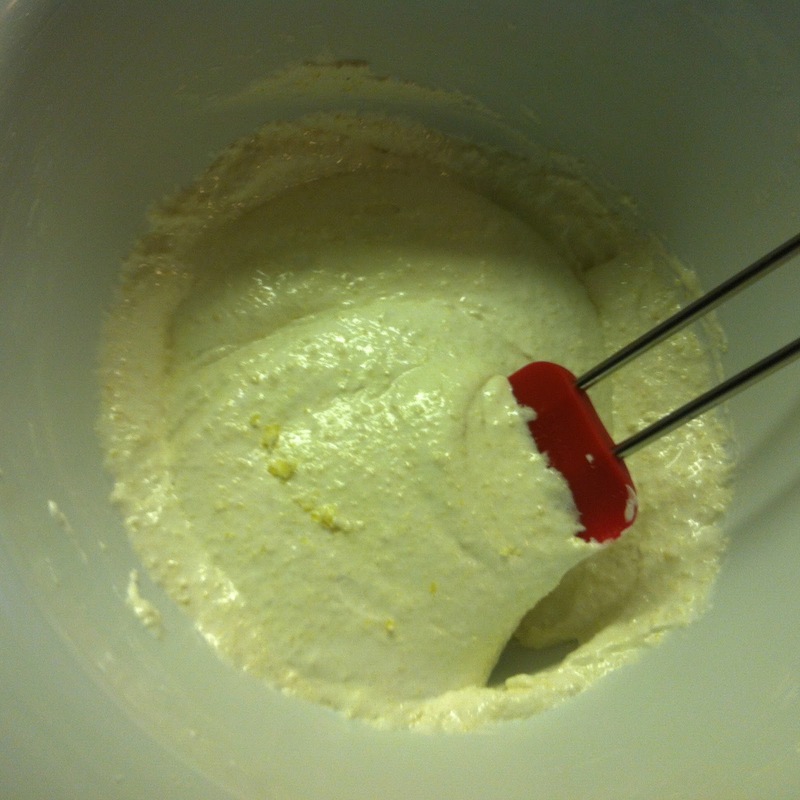 Then sieve the flour mixture into the batter and mix carefully. 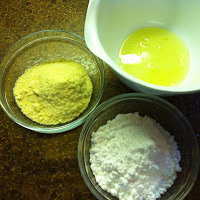 Divide the dough into three equal portions, preferably using a scale: each part weighs about 200 g) and carefully mix the food coloring into the batter. 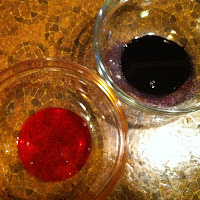 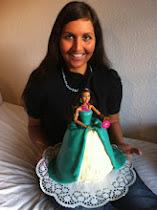 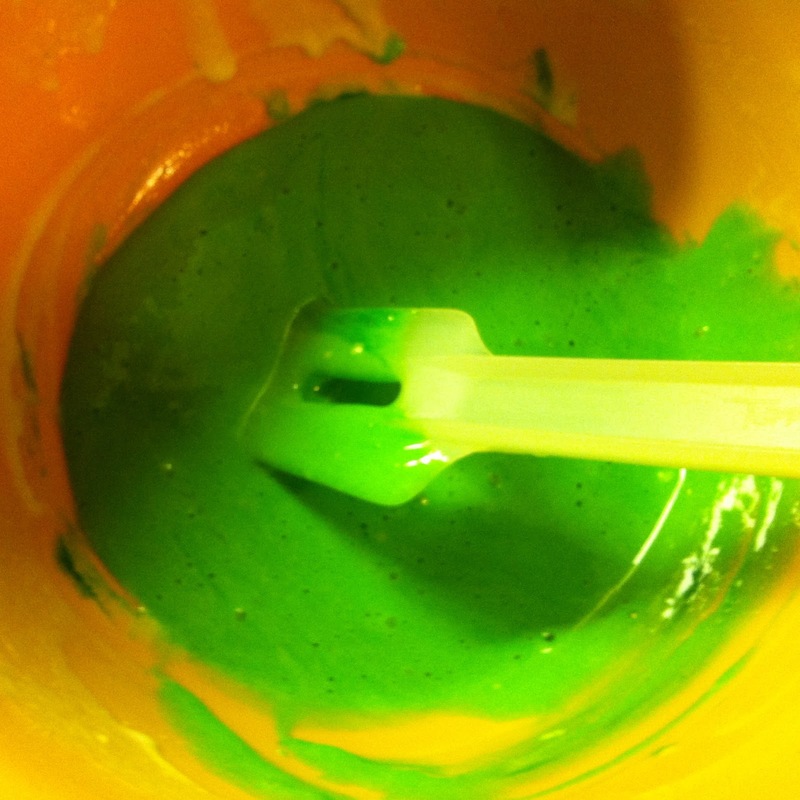 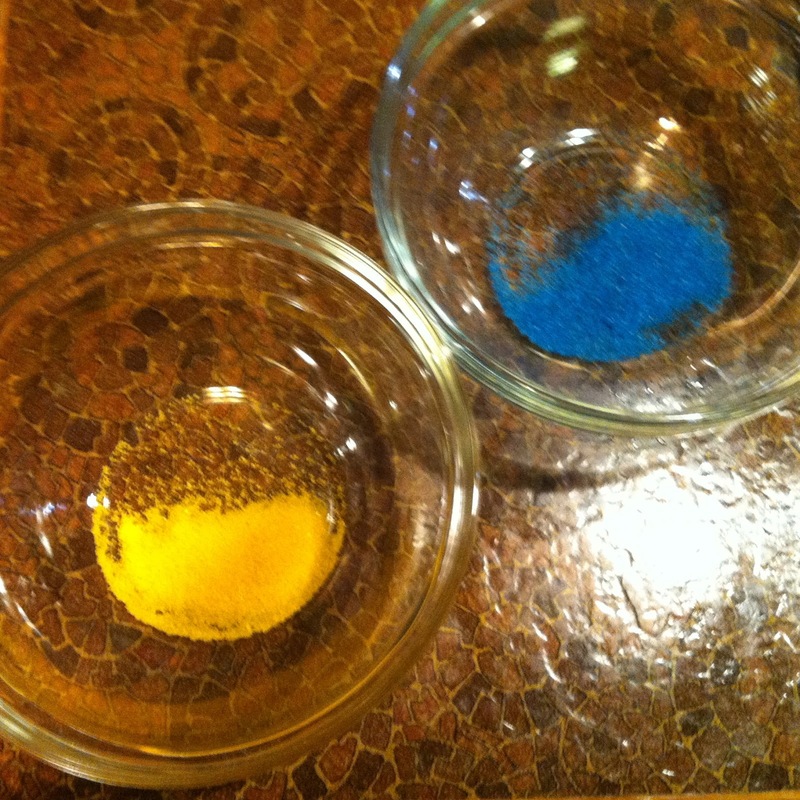 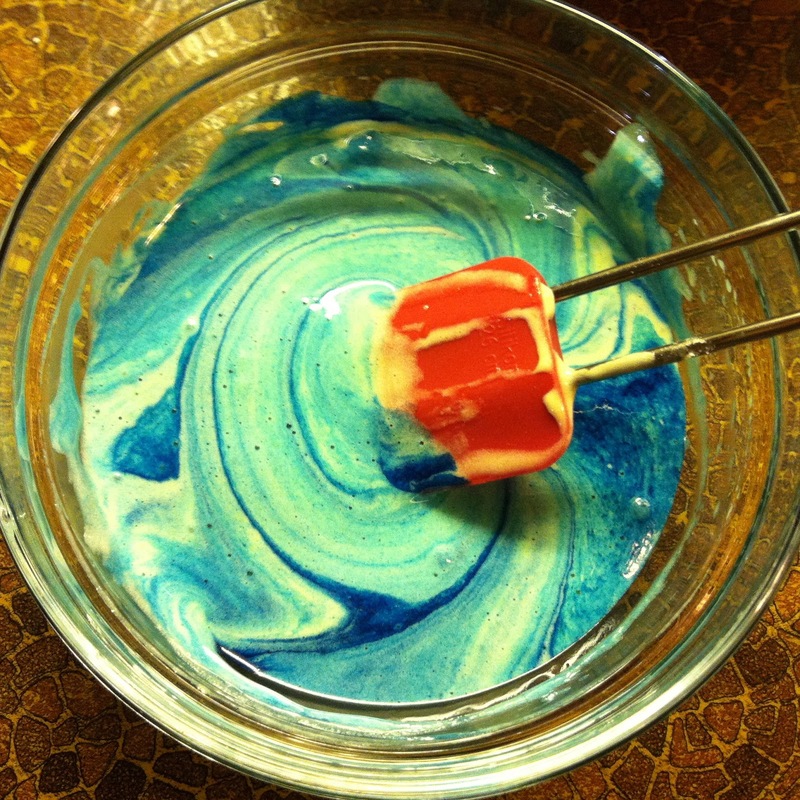 I mixed the powder food coloring with 1-2 tsp water to make it distribute well in the cake batter. Line the floor of a spring form with baking paper, do not grease the edge of the form, fill in each portion of batter and bake individually for about 10 minutes at 190° C. I could not let the cake cool for long, because I wanted to quickly bake the next color, but it has worked out just fine. 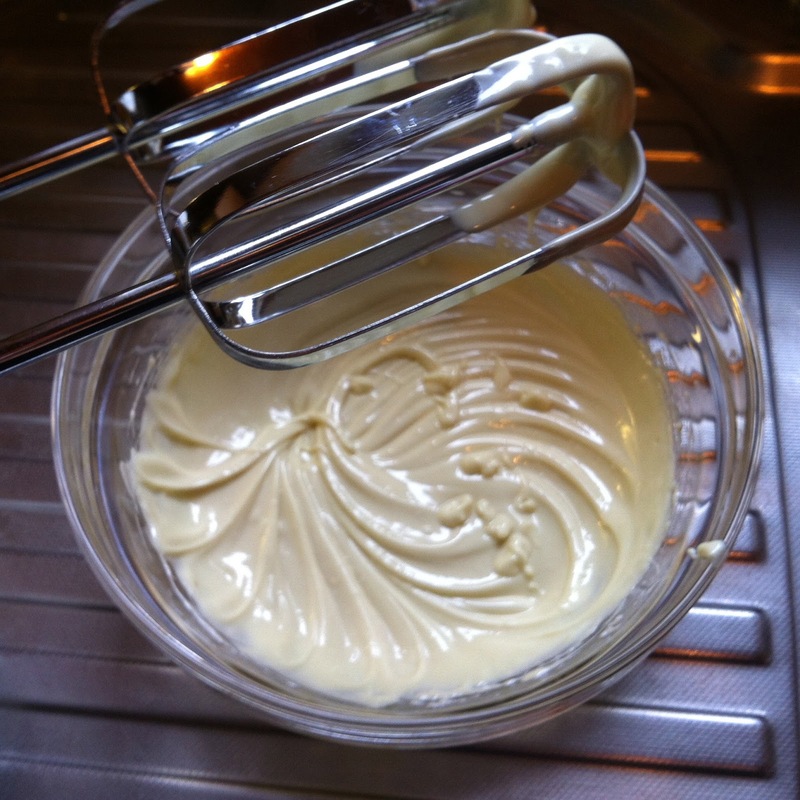 Note: the lever for the spring-form made from another material than the rest of the form, and it gets substantially hotter! 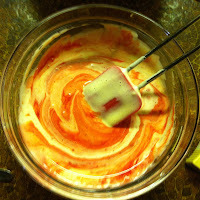 Proceed with the second half of the cake batter ingredients and color the dough with the remaining three food colors. 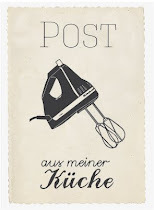 If you make two small cakes, cut the finished cake bases in half horizontally. 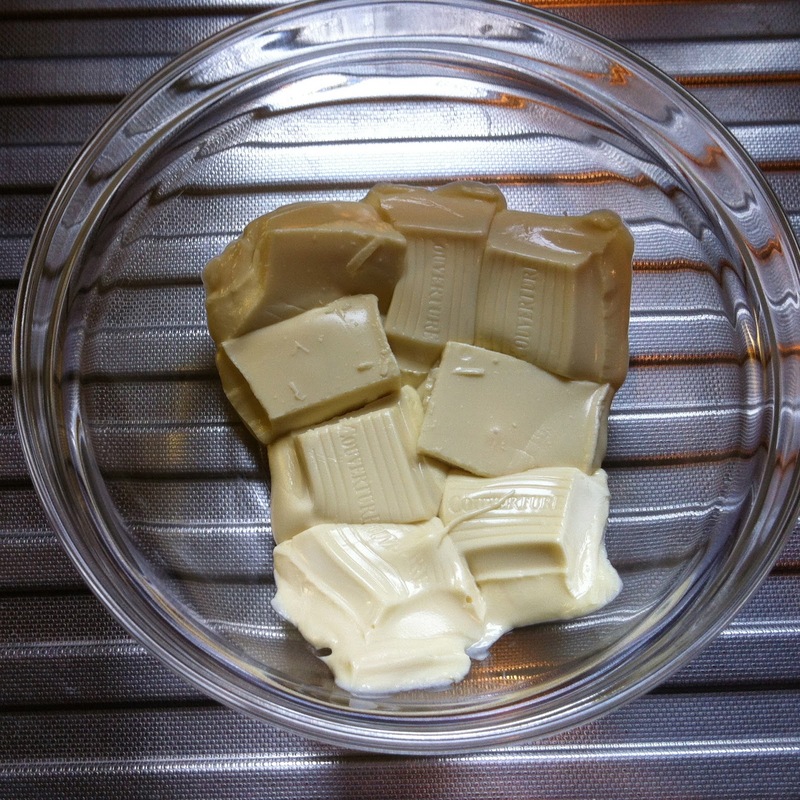 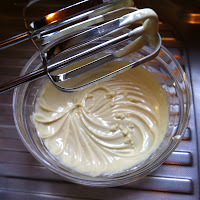 Melt the white chocolate, mix it and stir in the cream cheese. Assemble the sponge cakes according to the colors of the rainbow, always with a thin layer of filling (about 1 cm) between two cakes. 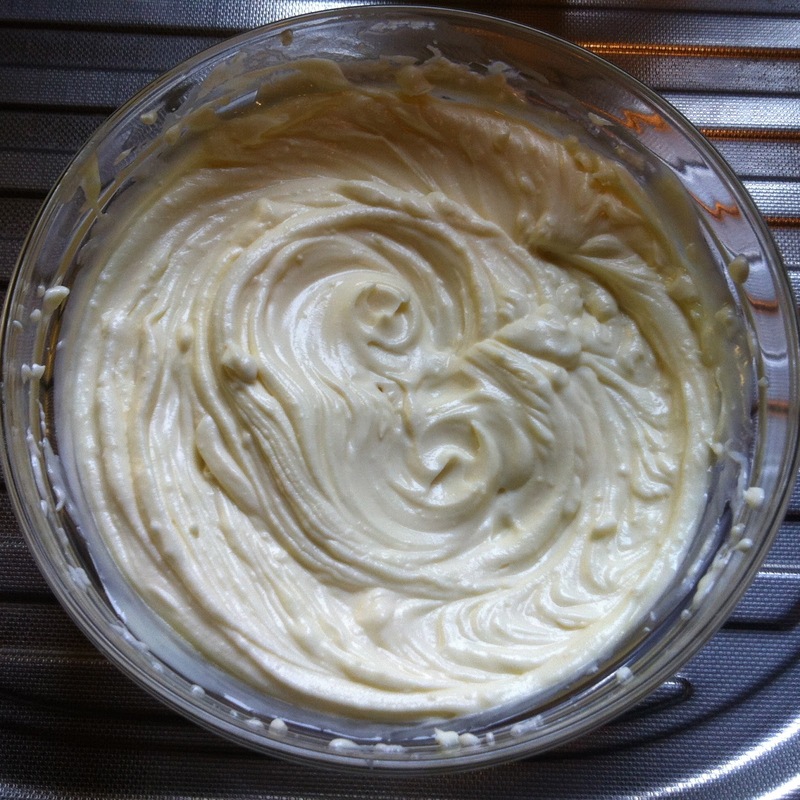 Retain some filling for the macarons. 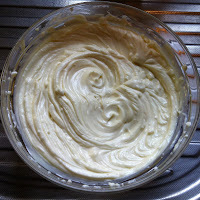 Then cover the cake with the filling and sprinkle with shredded coconut. 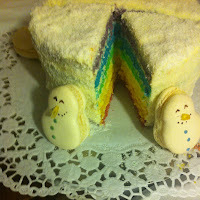 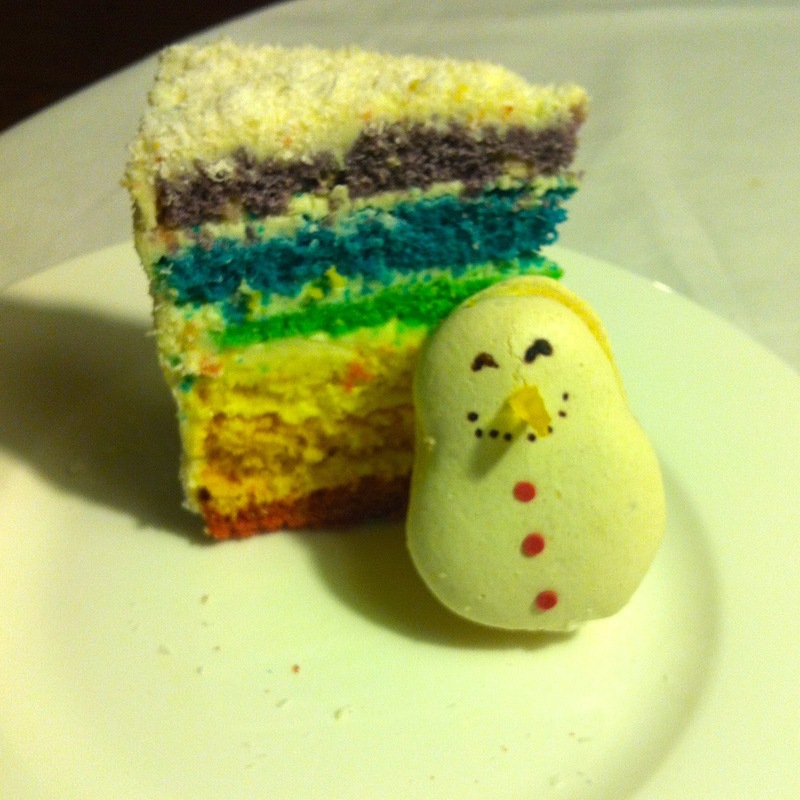 And that's your Rainbow Snow Cake! 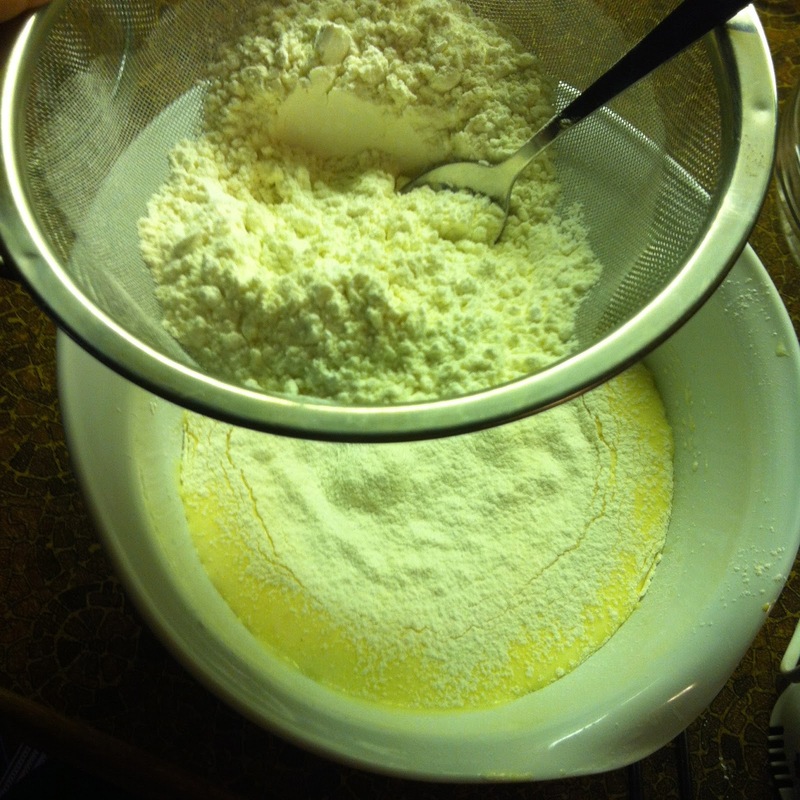 Line two baking racks with baking paper, weigh out and sieve sugar and powdered sugar. Beat the egg whites until stiff, add the sugar and continue beating. 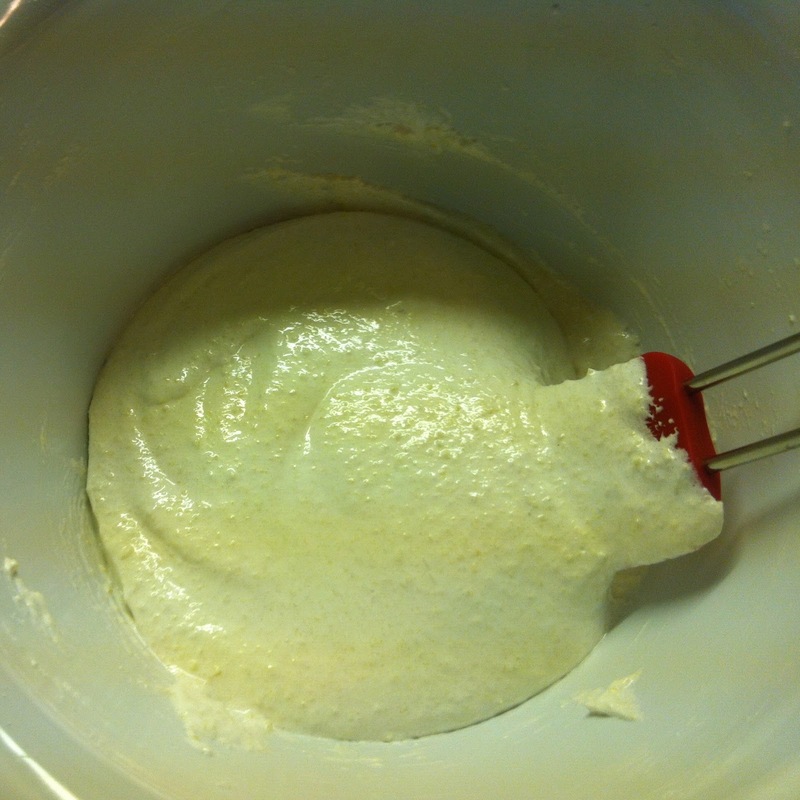 Add the almond flour and fold. 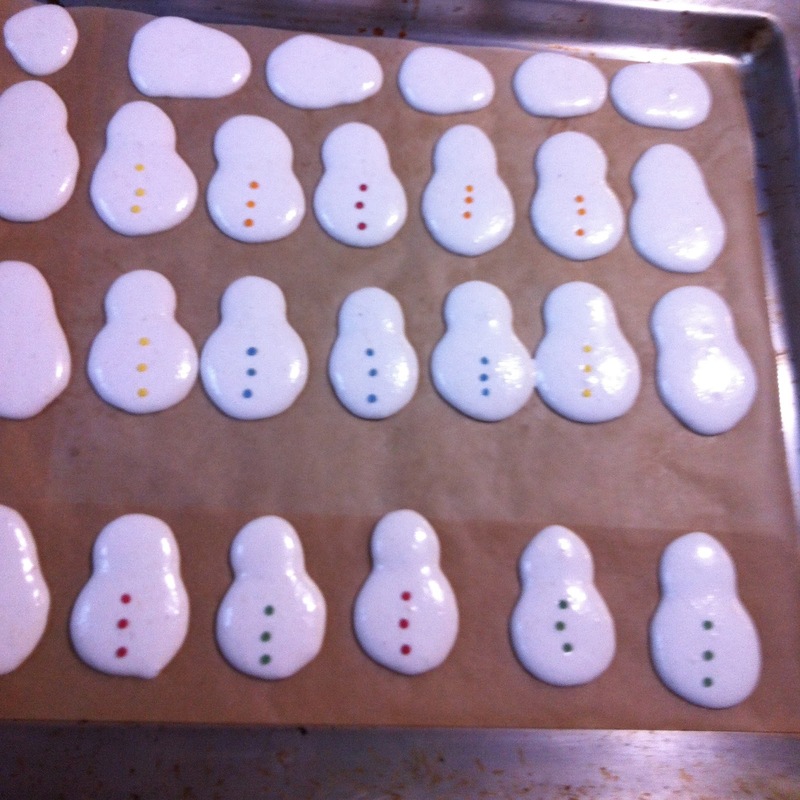 Fill the batter into a piping bag and pipe snowmen on the baking paper: a large dot with about 4 cm and smaller with with about 2 cm diameter. 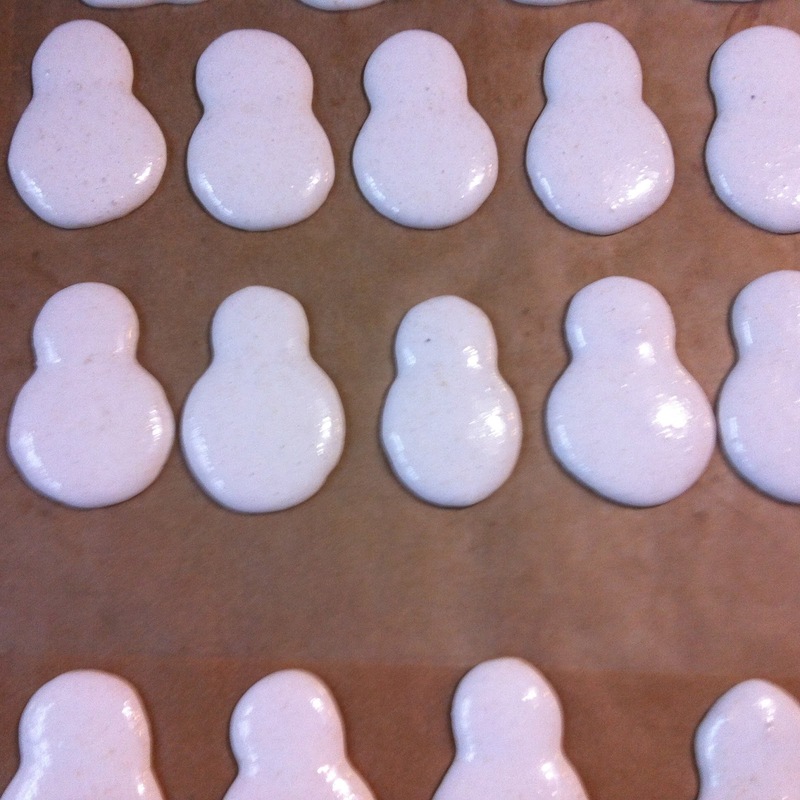 If the macarons have peaks from the piping, knock on the baking racks from the underside with your flat hand. Decorate half the macarons with sugar confetti for buttons. 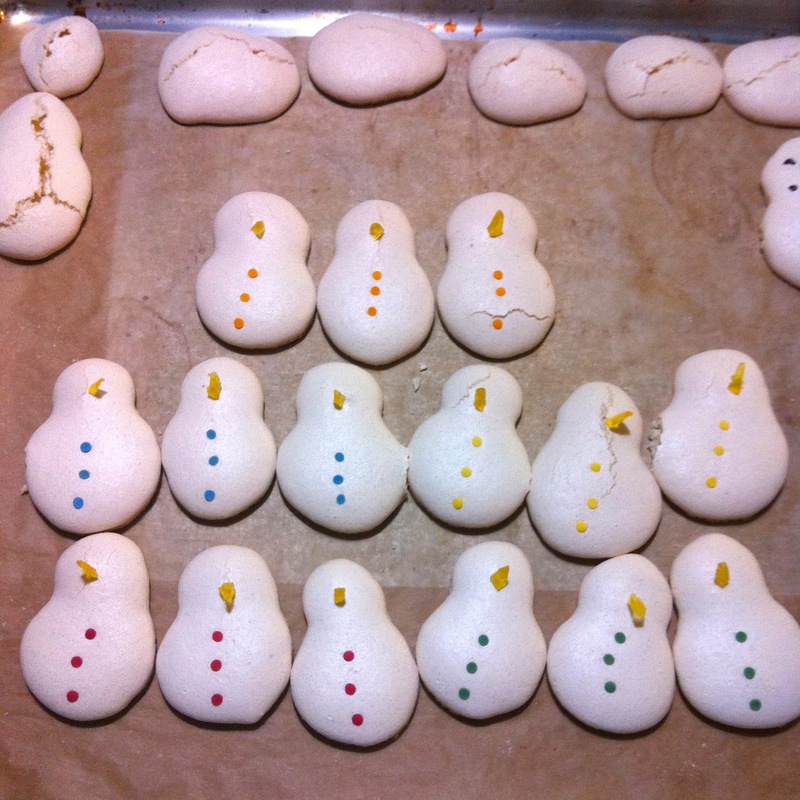 Let the macarons dry for at least 30 minutes or a little longer - a few of my macarons cracked, so I would dry them longer the next time. 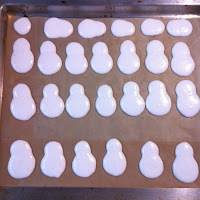 Preheat the oven to 140 ° C with convection and bake for 15-20 min. 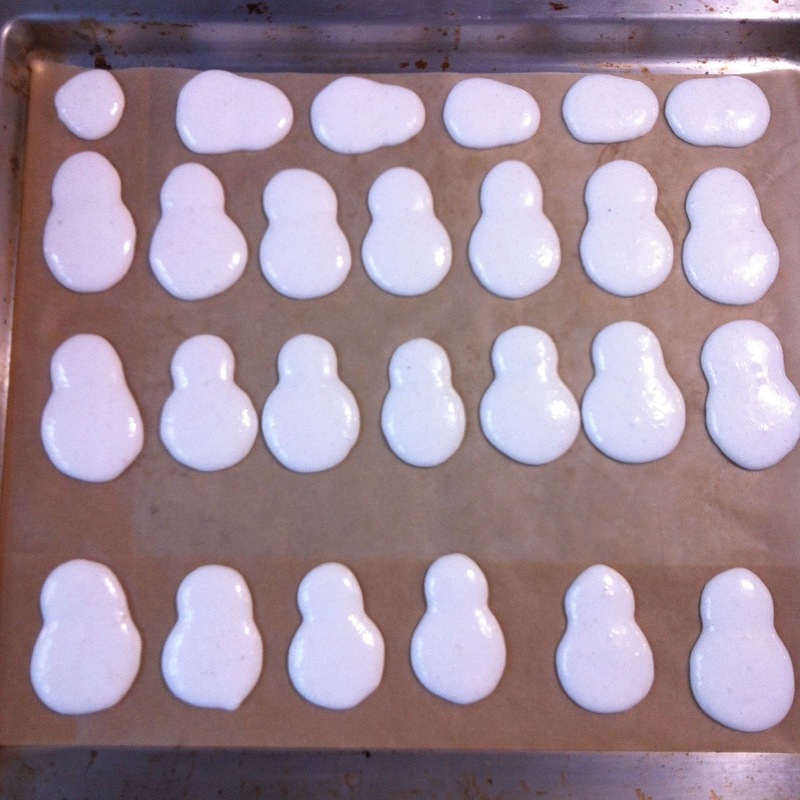 The macarons are done when they can be easily removed from the baking sheet, otherwise continue to bake them a few more minutes. 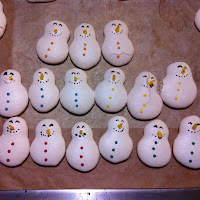 Let the snowmen cool (haha) and loosen them from the baking paper. 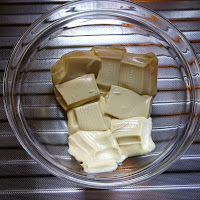 Mix the cocoa powder with very little water. 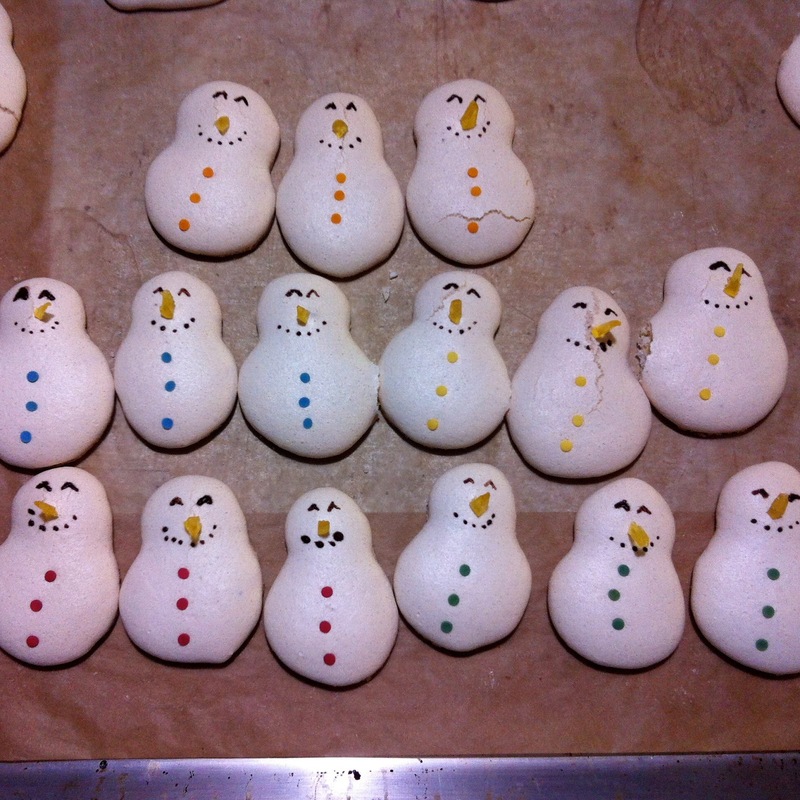 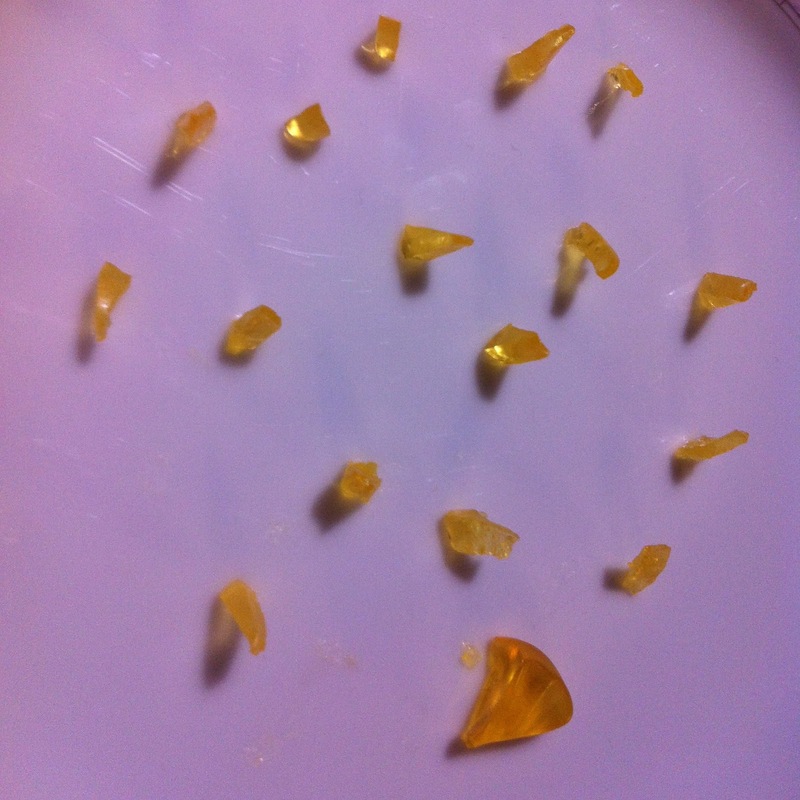 Slice the orange wine gum into small wedges, cut the wedge's back part so that it sticks, and add the noses to the snowmen's faces. 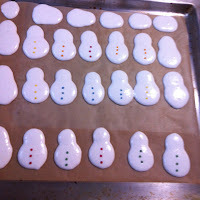 Paint the macarons with the buttons with the cocoa mixture, for example using a toothpick. 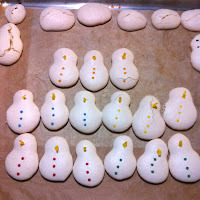 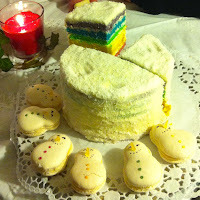 Use the filling to glue two snowman macarons together and decorate the cake with them. Et voilà!